And, because it’s such a unique destination, we recommend contacting our call center for an easier booking process. United Airlines® has great flight options. We have the package for a wonderful trip. InterContinental Hotels & Resorts is the leading chain of luxury hotels in Polynesia and one of the first to move into the archipelago. Just 10 minutes from downtown Papeete and facing the beautiful black volcanic sand beach of Lafayette Beach in the famous Matavai Bay. This luxury resort is set on a magnificent islet surrounded by the most beautiful lagoon in the world and offers stunning sights. Possibly the most glamorously famous island in the world. Located on its own islet and suspended between turquoise waters and limitless skies. This resort occupies what people say is the most beautiful site in French Polynesia. Two white sand beaches set the scene for the ultimate escape. Whether you are looking for an unforgettable vacation or a destination for a romantic honeymoon, Hotel Maitai welcomes you. Ideal for nature lovers, the resort is nestled in a tranquil cove, with jagged volcanic peaks behind and the great expanse of the South Pacific in front. 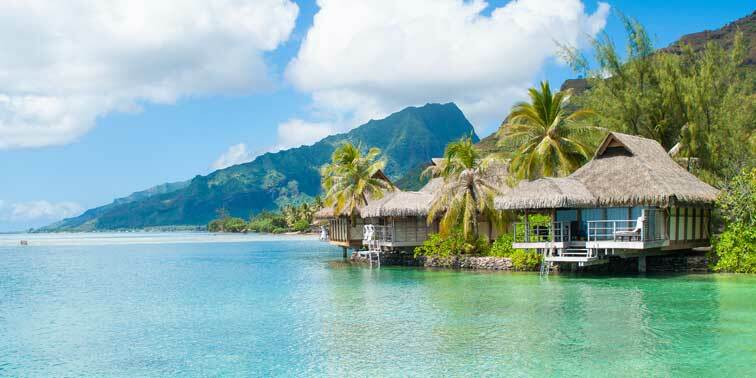 Moorea is one of French Polynesias most inspiring destinations. This resort sits on a crystal clear lagoon with white sand beach and at it's back jagged green mountains. Located on the lagoon between the passes of Avatoru and Tiputa. A dream destination with it's exceptional sunsets and stunning underwater seascapes. 1Promo code ISLAND350 is valid for travel 10/26/18 - 7/31/19 for air/hotel and hotel only packages to Hawaii/South Pacific, 2-night minimum stay required. Save up to $350 per reservation based on a 6% discount on the hotel portion of the vacation. Valid on new bookings made between 6 pm CST on 10/25/18 and 6 pm CST on 11/15/18. Must enter promo code ISLAND350 at time of booking.